IIoT-ready Human Machine Interfaces (HMIs) allow manufacturers to take data from the floor and share it with a local or cloud-based server, where it can be used company-wide, regardless of the users location. The translation of machine data to actionable information allows companies to make cost-saving decisions and allocate resources more appropriately. IIoT-ready Human Machine Interfaces (HMIs) allow manufacturers to take data from the floor and share it with a local or cloud-based server, where it can be used company-wide, regardless of the user’s location. The translation of machine data to actionable information allows companies to make cost-saving decisions and allocate resources more appropriately. But many OEMs are hesitating to implement, not taking advantage of the available technology. Even if customers are not ready to integrate their systems right away, they will want to implement an IIoT strategy to keep up with their competition. When customers decide to implement the IIOT concept, your machine should be ready without the need for downtime and replacements. Despite the benefits, OEMs may not recognize the full value of starting implementation early. Too often, they have fears about how difficult or costly the process is. Here are some of the most common misconceptions, are they stopping you from valuable upgrades? Misconception 1: Implementation is extremely costly. There are ways of becoming IIoT-ready without major capital investments. For example, some IIoT-ready HMIs can range from $299 for compact applications to $1,990 for machines that need more robust systems. Misconception 2: It’s better to wait for a consensus to develop before investing. Some OEMs feel that if they start upgrading now, they won’t be flexible in the future. As Lanette Mannon, Maple Systems Marketing Manager, explains, “Some OEMs are being conservative, seeing what others are doing before jumping onboard.” While the mindset is understandable, there are HMIs that offer you flexibility by supporting a variety of communication protocols. MQTT, in particular, is a versatile tool; it is an emerging “lightweight” messaging protocol with cloud compatibility. Paired with an IIoT-ready HMI, MQTT enables secure communication with a wide array of PLCs, sensors, and more, regardless of the device’s protocol. If your HMI supports many common protocols, you (and your machine) can remain flexible. Misconception 3: The value of the IIoT doesn’t measure up to the hype. • The customer gets a view of how their systems are actually performing, so they can optimize their production (and use of machinery) and automatically track maintenance or operations costs. • A secure connection safely allows for advanced remote functionality such as email alarms, remote access, remote monitoring, and remote programming. Plant managers can monitor machines from the palm of their hand, while email alarms alert staff immediately for expedited action. • Offsite troubleshooting and configuration reduce travel expenses and costly downtime, saving money for both the OEM and customer. • The OEM can track how their machines are performing. They can also use data to schedule predictive maintenance. • The customer can take a more proactive sales stance with data on trends, users, and orders. This may help them to predict inventory needs more accurately and be better prepared. • Some HMIs can store data using a SQL format if access to the Internet is interrupted, to prevent data loss. Beyond the immediate benefits, OEMs gain insight, and can design future machines according to data collected on how each feature is used, where the machine shines, and where it struggles. Knowing how customers actually use their machines allows them to better understand their customer and highlight popular features in marketing materials. Misconception 4: Adding an IIoT-ready HMI will be complicated. “In literature, there is generally a lack of concrete steps that companies can take. People don't know where to start,” says Mike Sheldon, Applications Engineer. Forward-thinking HMI developers understand the confusion, and some are taking steps to make IIoT implementation easier for customers through software systems that are simplified and condensed, making them easy to execute at many skill levels. For example, Maple Systems recently introduced EasyAccess 2.0, an affordable software service that enables the remote monitoring and support of HMIs in the field. The software offers the functionality of an IIoT system with an easy-to-use, simplified interface. 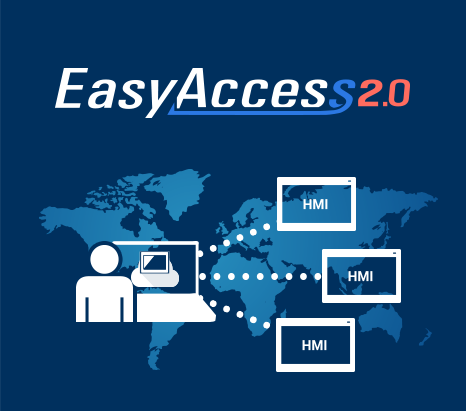 With EasyAccess 2.0, an OEM can update the functionality of the customer’s HMIs remotely, eliminating the need for onsite visits when the customer is ready to adopt IIoT capabilities. Misconception 5: It’s better to wait until customers request it. With any type of technology, the old adage is true: the early bird gets the worm. When an OEM adopts IIoT-ready technology, they can start marketing the machine to potential customers as being IIoT-ready. Though customers might not be taking advantage of these features just yet, the functionality is there. When customers decide they want to start reaping the benefits, it’s as easy as downloading an application. They don't have to order new hardware, make a service call or spend a lot of money to make changes. As Sheldon, says, “If you have systems that are upgradable in the field, then you have the peace of mind knowing that when you're ready, you can keep up with the competition.” It’s really important that OEMs stay ahead of the curve now so that they can be competitive when the time is right. Maple Systems has been a leading manufacturer of HMIs for over 30 years, specializing in affordable, versatile HMIs that integrate with devices from a diverse set of manufacturers. Maple HMIs support more than 200 different communication protocols, including MQTT for secure communication. They also support Profinet, Ethernet IP, and other protocols that have potential to become the common IIoT communication protocol. With IIoT-ready HMIs in a range of size and features, Maple Systems has the flexibility to meet a variety of needs. 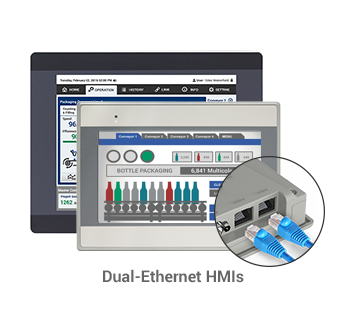 Additionally, Maple Systems HMIs are capable of protecting you and your customers during interruptions in Internet access, storing data until connectivity is restored. In real terms, the IIoT is just a fancy way of saying you’re connected. Connected to machines, connected to data, and connected to the web—worldwide, instantaneously. 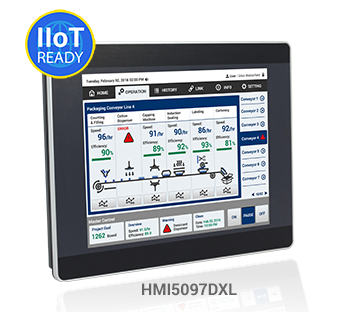 Maple Systems HMIs can ensure an OEM’s machines will be IIoT-ready today, when customers request this functionality today, tomorrow, and well into the future.